High performance: Immediate response and high performance is matched by lower amounts of noise and vibrations further reduced by the balance shaft and the optimized engine suspension. Compact, robust and lightweight: The engine is lightweight and extremely compact for its large swept volume and high output. The rigid cast-iron cylinder block and cylinder head, and exactly controlled fuel injection give excellent onboard comfort. 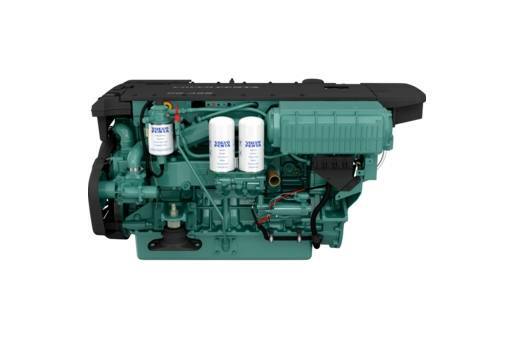 Unique Marine Torque: Volvo Penta engines excel with their unique marine torque. High torque at low rpm gives rapid acceleration to the plane and massive maneuvering power. Even at high load and high rpm, the torque remains strong to provide efficient cruising speed in all conditions. Low fuel consumption: The high-tech fuel injection system helps make the engine highly fuel efficient. The control unit monitors several parameters which reduces the overall fuel consumption. Electronic Vessel Control: Volvo Penta Electronic Vessel Control fully integrates the engines, electronics and the unique set of optional features, such as Single-lever Mode, Cruise Control, Glass Cockpit and more. e-Key is standard.